Summary: Bissell 9595A Vacuum with OnePass Technology is great for thick carpet and pet hair with its attachment tools. It’s a Time-saving and an environment-friendly vacuum cleaner which keeps your carpet and air clean. OnePass tech ensures the least time expenditure possible and you won’t need to vacuum a place more than once. Here you will find details about another bagless model vacuum of renown Bissell Co. the Bissell 9595A vacuum with OnePass technology. When it comes to the editor’s choice this vacuum cleaner will be the number one vacuum under 100 dollars. It will be the utmost deal within $100. Want quick suggestions from me to select the best all-rounder vacuum cleaner under $100? Then my suggestion will be the Bissell 9595A vacuum cleaner without any hesitation. Because this is the only vacuum cleaner which gives you multi features at low budget. For an overall performance, BISSELL 9595A will be the best for those who are looking for a vacuum cleaner at low budget. It has the deep suction power with wide big cleaning head which gives you an awesome advantage for carpet cleaning !!! It’s premium hose attachment that makes it very convenient for stairs and pet hair. 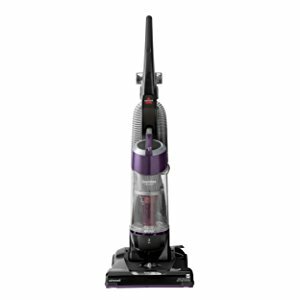 So If you are looking for the best vacuum for stairs or pet hair in your minimum budget then BISSELL 9595A will be the choice. So, for a multi-featured vacuum at under 100 dollars, you can definitely buy BISSELL 9595A CleanView Bagless Vacuum with OnePass. 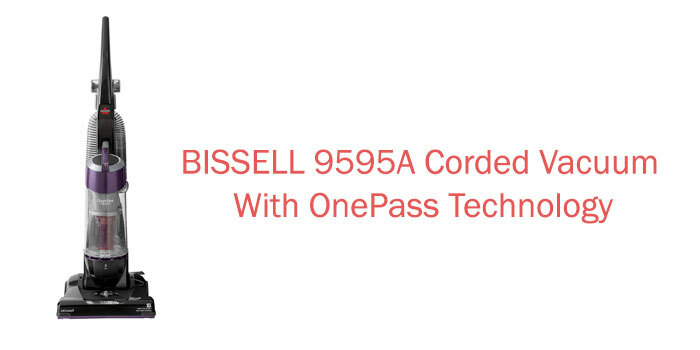 Suction Power: The Bissell 9595A upright vacuum comes with the OnePass technology or whatever they call it. That’s not the fact, the fact is this is actually a great notion of a great suction power. Marvelous for thick carpets! So does the carpeted stairs. Lightweight: It is one of the lightest vacuums comparing to other upright vacuums. Bissell 9595A weighs only 15Lbs and as an upright vacuum cleaner, it’s very lightweight. Giant Dirt holder: Bissell 9595A is bagless and it comes with big, giant dirt holder. No need to change the bag, even no need to empty the dust cup on a regular basis either. Though it makes the overall unit a bit bulky too to fit under little desks or chairs, you know that you have to lose something to get some. Premium Hose attachment: Here comes the best part of this vacuum cleaner. It is shipped with some great convenient accessories and attachments to cover all types of cleaning you need. And the best among them is the Premium hose attachment. It is found on pricey vacuums and the way it to be attached to the main unit, simply great to use and hassle-free. Moreover, it makes the Bissel 9595A an unbeatable vacuum for carpeted stairs and pet hair in this price range. Anti-Allergen: Last but not the least, it can be equipped with an additional filter bundle that makes your surroundings allergen-free and a very healthy one. Its use standard HEPA Filter (High-Efficiency Particulate Arrestance) so it Doesn’t just clean the floor also clean the air too. What Are Other Customers Talking about? The Bissell 9595A is being the reason for the happiness of a lot of customers for long. A dedicated review contributor stepped ahead and gave his honest review. He took a long sort of documentation to monitor the durability and efficiency of the Bissel 9595A vacuum cleaner. Another customer states, after a period of some researching, she ends up buying the Bissel 9595A due to its remarkable performance over pet hair. Though she was ready to pay big, her problem was solved just by paying only below 100$. A great output was comparing the price. Are you curious about what other customers are saying about the Bissell 9595A? Powerful suction, extra ordinary powerful comparing its price range. As said earlier, for the big dust cup, it might not fit under tiny desks. But I’d suggest to take it more as a pro than a con. Big dust cup isn’t a thing you look everywhere. Other than these, I bet you can’t find any other negative issue for this model of BISSELL Vacuum Cleaner at least within this price range. It is one of the Best-Seller vacuums in upright vacuum category for quite a long time, and that is not for the void. Thousands of people have bought it and perfectly happy with it. Thousands of people can’t be wrong. Can you prove them wrong?